A previous blog 1 looked at a pre-published study on vitamin B12 status in Spanish vegetarians and vegans. Because there are very few reports on plant-based dietary patterns in Spain, this blog will look at the same study 2 in more detail, now that it has been published in its final form. While looking at B12 status amongst lacto-ovo vegetarians (LOV) and vegans (VN), it became clear that establishing true levels of this vitamin is a much more complex matter than most people realise. And, since side-effects of B12 deficiency are so nasty, this might be a blog worth reading – especially if you’re a plant-eater. Thus, before looking at this study, it’s worth going into a bit more detail about vitamin B12. Why is B12 status so important? 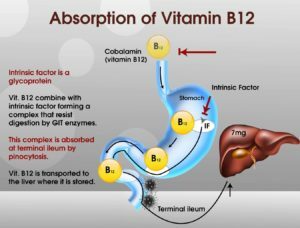 In normal healthy bodies, vitamin B12 (cobalamin) is readily absorbed in the distal ileum (the last part of the small intestine). However, in order for it to be absorbed, it must combine with a vital substance called intrinsic factor, which is a glycoprotein secreted by parietal cells of the gastric mucosa within the stomach. Without intrinsic factor, vitamin B12 will simply pass through the body and get excreted in stools. Both vitamin B12 and vitamin B9 (folate) are necessary for the formation and maturation of red blood cells (erythrocytes) and the synthesis of DNA – the genetic material of cells. Vitamin B12 is also necessary for normal nerve function. 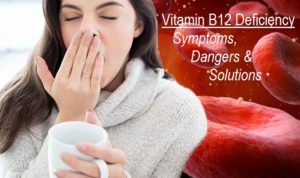 Since B12 is so essential for the formation of mature blood cells, any deficiency of this vitamin can result in anaemia, causing the body’s cells to receive insufficient oxygen from the haemoglobin within the red blood cells. This is characterised by abnormally large red blood cells (macrocytes) and abnormal white blood cells. It may not develop until 3-5 years after the deficiency starts. This is because around 3-5 years worth of B12 can be stored in the liver – so long as you’re an adult who has already been able to store sufficient quantities. No other B vitamin (or vitamin C) can be stored in the body like this, since they are all water-soluble (including B12) and are generally flushed out of the body if there is excess within the diet. On the other hand, the fat-based vitamins (A, E, D and K) can be stored in fat tissues as well as the liver. This means that daily intakes of the water-based vitamins (vitamins C, B1, B2, B3, B5, B6, B7, B9 and B12) is really important for maintenance of optimal health. As we age, our ability to absorb B12 decreases. This happens irrespective of dietary habits, but obviously there’s a bigger threat of deficiency (in all ages) for those who don’t eat animal products- the major source of B12. Bacteria in the soil and elsewhere produce B12. Animals don’t actually produce it themselves. If we still drank from pure streams and ate food we picked up from untreated soils, we’d get sufficient B12. However, with chlorinated water, pesticide-treated soils, and shrink-wrapped food, we either have to eat animal products or take supplements to ensure we get enough B12. There are plants that contain some of the vitamin (see below), but they are generally considered insufficient on their own to maintain healthy B12 levels. Pernicious anaemia is a form of megaloblastic anemia where intrinsic factor is lacking. There may well be plenty of B12 in the diet, but if intrinsic factor is not present or, for some other reason, is not able to play its role in the the absorption of vitamin B12 from the small intestine into the bloodstream, then the B12 passes through and out of the body. This may be due to a number of reasons. For instance, abnormal antibodies, produced by an overactive immune system, may attack and destroy the parietal cells in the stomach that produce intrinsic factor, resulting in an autoimmune reaction called autoimmune metaplastic atrophic gastritis. Alternatively, intrinsic factor may be lacking because the part of the stomach where intrinsic factor is produced has been surgically removed. Anaemia caused by vitamin B12 deficiency develops gradually. This allows the body to adapt to some extent, but this can mean that symptoms are mild while the anaemia is actually very severe. Pernicious anaemia in younger adults (due to lack of intrinsic factor) is more likely to result in the development of stomach and other gastrointestinal cancers. In addition to the above neurological effects, some people can also become confused, irritable, and mildly depressed. Advanced vitamin B12 deficiency may lead to delirium, paranoia and impaired mental function, including dementia. Routine serum blood tests can often show a suspected B12 deficiency if large red blood cells are detected. Since folate (vitamin B9) is also responsible for red blood cell synthesis, a possible B9 deficiency would normally also be investigated. B12 deficiency can also be suspected if people complain of the typical symptoms associated with nerve damage, such as tingling or loss of sensation. If the deficiency is suspected, the level of vitamin B12 in the blood is measured. Additionally, serum gastrin 6 levels or autoantibodies 7 to intrinsic factor may be measured. The Schilling test involves the patient being given two doses of B12. The first is ‘labelled’ with a small amount of a radioactive substance and is then taken by mouth. The second is an injection of a larger amount of B12 that is not radioactively labelled. After the injection is given, the amount of labelled B12 (that which had been taken orally) is measured by testing the urine to determine whether the body absorbed a normal amount of the vitamin. If this normal amount has not been absorbed (revealed by a high amount being found in the urine), then the deficiency is confirmed. The same test is then repeated to check for the cause. This time, people are given intrinsic factor with the B12 taken by mouth. If intrinsic factor enables the body to absorb more of the vitamin, then it’s confirmed that the deficiency is caused by a lack of intrinsic factor, and the diagnosis of pernicious anemia can be made. Endoscopy is the use of a flexible viewing tube to directly examine internal structures. It may be done to check for destruction of the parietal stomach cells that produce intrinsic factor. If vitamin B12 deficiency is confirmed in an older person, it’s unlikely that either Schilling or endoscopy will be used. This is because the cause is likely to be the usual age-related reduction in stomach acidity, and is usually not serious. However, in a younger person, other tests, including other blood tests, Schilling test and endoscopy are likely to be used in order to establish intrinsic factor status. It’s important to note that high folate (vitamin B9) levels can give a false negative for B12 deficiency. That is, high levels of folate in the blood sample can make it look like there’s no B12 deficiency. This is because the constant supply of folate allows the red blood cells to appear normal in size, while the other serious neurological damage of B12 deficiency can go unnoticed, in spite of the person having regular blood tests for B12 deficiency. Of course, those people most likely to have a B12 deficiency while having high dietary folate intake are those eating a plant-based diet – given that there’s so much folate in plant foods. This is why B12 supplementation is so important. For less advanced deficiency, B12 supplements generally do the trick; however, if people already have nerve damage, or they have pernicious anaemia (for instance, caused by having had the part of the stomach removed which produced intrinsic factor), then the B12 is normally given by injections into a muscle for defined periods so long as the disorder is uncorrected. Since the B12 in supplements is easier to absorb than that in meat, older people with deficiency can benefit from taking B12 supplements. In most people with mild to moderate anaemia, there is a normalisation in around 6 weeks of treatment with high doses of B12 supplements. However, in severe cases due to nerve damage or loss of ability to produce intrinsic factor, the treatment by B12 injection could last for the rest of their lives. Unfortunately, in those with dementia resulting from B12 deficiency (mostly older people), mental function would not be expected to improve after treatment. How much B12 should I supplement? I covered this subject in some detail in a previous blog 8 , which I suggest you take a look at if you are unsure about how often and how much B12 you should be supplementing. The above are some of the foods normally used to produce B12 supplements for veggies and vegans. Animal sources highest in vitamin B12 include meats (especially beef, pork, liver, and other organ meats), eggs, fortified cereals, milk, clams, oysters, salmon, and tuna. It’s been reported that B12 deficiency exists much more widely in omnivore populations than one might imagine, since modern animal rearing practices are causing a reduction in the levels of B12 in meat. This can be seen particularly clearly, for instance, in the need to given cobalt supplements to cattle and sheep because of the reduced levels of cobalt in modern cultivated soils (B12 is called cobalamin because it contains a cobalt atom) 12 . In broad terms, two parts of this study are of particular interest: firstly, the difficulties involved in accurately diagnosing B12 deficiency (and the suggested additional tests by which this can be more accurately diagnosed) and, secondly, to see if there was any pattern of B12 deficiency between the two groups – lacto-ovo-vegetarian (LOV) and vegan (VN). 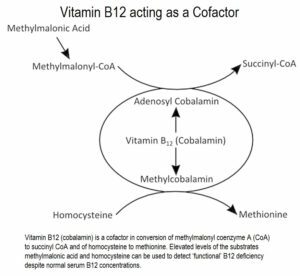 Vitamin B12 acts as a cofactor 22 of the enzymes methionine synthase 23 , which acts in the conversion of homocysteine (Hcy) to methionine, and methylmalonyl-CoA mutase 24 , that produces succinyl-CoA from methylmalonyl-CoA, the active form of methylmalonic acid (MMA)17 . The above reactions are involved in the methionine cycle 25 and the folate cycle 26 , both essential for DNA and RNA synthesis, erythropoiesis and the production of neurotransmitters. 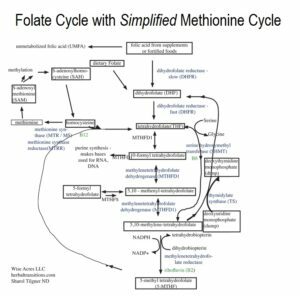 The folate cycle is so important to the methionine cycle (also called the methylation cycle) that it’s often included in descriptions and diagrams of the methionine cycle. The following diagram should give you an idea of how interlinked and complex these cycles are. Testing for homocysteine (Hcy) levels – a more specific marker of functional vitamin B12 deficiency – would be a useful additional test. This is because Hcy levels rise in the presence of cellular B12 deficiency. So, is that sorted, then? Well, not quite. Another problem arises – namely, that Hcy levels can also be raised with deficiencies of vitamins B9 (folate) or B6 (pyridoxine) as well as by diets rich in methionine 29 . So back to the drawing board. So, what about testing for MMA levels? This represents probably the most specific marker for vitamin B12 deficiency, since it’s independent of folate and vitamin B6 status. MMA levels increase when there’s a B12 deficiency, and this happens even before there are any obvious clinical symptoms of the deficiency. So, the researchers in this study suggest that when testing for B12 deficiency, relying on just one single standard marker of deficiency is to be avoided. Instead, several markers should be used – levels of serum B12/B9, Hcy and MMA 30 . However, when MMA was measured, some subclinical deficiencies were detected, particularly in the non-users of vitamin B12 supplements, with no significant differences between VN and LOV. With elevated MMA being detected in more than 10 % of the study subjects, it’s clear that using this marker to detect subclinical deficiencies is a pretty good idea. When B12 status was assessed with serum vitamin B12, MMA and Hcy simultaneously, the proportion of subjects with values out of range of at least one of the biomarkers was remarkably higher than the proportion detected by using only serum B12. Most of the hyperhomocysteinaemic individuals presented mild HHcy (16–30 µmol/l) while only three volunteers had moderate HHcy (31–100 µmol/l). In the current study, Hcy was higher in LOV than in VN, which contrasted with other studies 36 . Erythrocyte folate levels were high in all participants, with more than 50 % surpassing the suggested 37 cut-off for high erythrocyte folate (1360 nmol/l). This is in line with other research 38 that found higher folate intakes in plant-eaters than in omnivores. With folate repletion and under similar B12 levels, it was observed that LOV had higher levels of both Hcy and HHcy than VN. The researchers said this might be due to the fact that LOV consume more protein and, thus, more methionine, being that both dairy and egg are higher in methionine than plant foods. By increasing blood levels of Hcy, high methionine levels are linked to increased risk of heart disease, tumour growth, brain damage and even death. Various studies 36 have reported lower B12 levels in vegans, but this was not observed in the present study. The reason for this is thought to be that the members of both Spanish groups had a high and extended use of cobalamin (B12) supplements, with B12 supplement users exhibiting higher serum B12 and erythrocyte folate levels (as well as lower MMA and Hcy) than non-users. This underlines the importance of supplementation for vegans and lacto-ovo vegetarians. Supplementation, diet or socioeconomic variation? In recent studies on vegetarian Indians 41 42 , a prevalence of B12 deficiency was found in around 70 % of those tested, with more than 50 % of the subjects also presenting HHcy. Thus, the researchers maintain that the sufficient B12 status observed in both Spanish groups (LOV and VN) can be mainly accounted for by the extended use of cobalamin supplements in the Spanish participants compared with the lower amount of such supplementation reported in other European studies. Having spent a significant time at our mountain retreat in Spain, it has always interested me that the Spanish do not fortify their plant milks – unlike the UK and elsewhere in Europe. This is a very good reason why any veggie living (or spending extended periods) in Spain should not rely on plant milks for their B12. Indeed, the current study emphasises that such milks had no influence on the analysed biomarkers in this research, being that these milks are not B12-fortified. Two limitations of this study were, firstly, that they didn’t add an additional omnivore group for comparison, since this would have shown whether and by how much these groups (LOV and VN) differed from the general meat-eating Spanish population and, secondly, this was a small sample (103 individuals) from which to generalise to the whole Spanish LOV and VN population – of which veggies are thought 45 to comprise around 1.5%. What would have been interesting, in addition, would have been to include a WFPB dietary group. Naturally, this is something that would prove very difficult in almost any country (perhaps excluding certain ‘enlightened’ populations within the US), since the number of people eating a WFPB diet is still very low. The report did not consider the influence of any potential genetic polymorphisms 46 that might be involved in the B12 and folate routes. Perhaps future B12 studies could look at this, as well as include a larger number of subjects and include both omnivores and those eating a WFPB diet. In any case, the take-home message is that anyone eating a plant-based diet needs to take B12 supplementation. It’s a cheap and highly effective way of avoiding health conditions that would undo some of the wonderful work achieved by eating this way.